LAUREN Barclay has told a packed funeral service she knew her brother Matty loved her, even if he didn't like to say it. 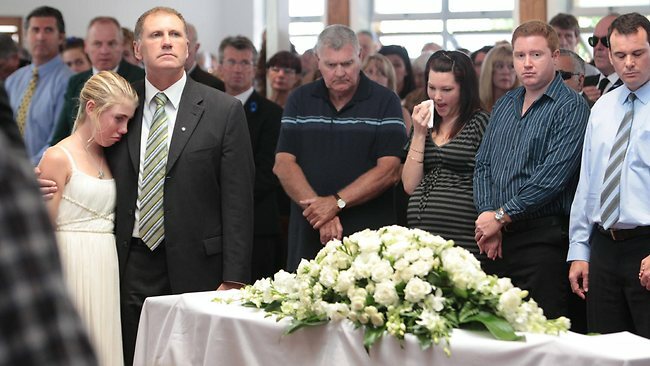 The younger sister of 14-year-old Matt gave a touching eulogy at her brother's funeral in Caloundra. She told of how they shared "good times and bad" like most siblings. Matty and Lauren had just started working together to team up against their parents. "I'm going to miss you Matt and you'll always be my big brother," Lauren said. Some personal items of Matt's were placed on his coffin: a hat to symbolise his youth, a Coolangatta Gold trophy to represent his tenacity, his Australian Championships medal to show change from a boy to a young man, and a medal for bravery belonging to his uncle. Family photos of Matt, from when he was only a small baby to pictures of him competing as a lifesaver, were played in a slideshow inside the church. Matt's coach Clint Robinson told of a chlorine-bleached haired boy who, above all else, wanted pecs, and to be an ironman. If Matt lost a race, it was not a major problem. "But God help the person he raced next," Clint said. Matt's godfather Mike Purcell told of the afternoon on October 1, 1997 when Donna Barclay went into labour. Donna's husband Steve was working at the Caloundra Police Station at the time and raced out after an urgent call from the obstetrician. No sooner had he left and Steve had raced back inside the station, much to the alarm of other staff. "I forgot my lunch," Steve replied. At 5.30pm on that day Matthew Barclay was born. Mr Purcell said the part of Steve that forced him to return to his lunch that afternoon was a trait passed on to Matty. Matt grew up in Kawana and attended Our Lady of the Rosary Primary School from Year 1 to Year 7. Mr Purcell said it was when he started playing rugby league that Matt encountered his first and greatest coach: his father. He went on to excel at basketball and any other sport he tried. And then came surf lifesaving. 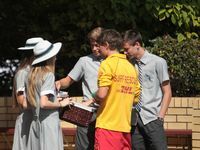 He started Year 8 at Siena Catholic College. "This was a year Donna and Steve started to see a change in Matty," Mr Purcell said. "He started to mature, he was tutored in physics and excelled. "Whether it had anything to do with the female German tutor he had, we'll never know." Matt began training at the gym and noticing himself in the mirror. He was a typical teenager who "didn't want to listen, wanted everything, wanted to do everything", Mr Purcell said. He described the mundane events of Matt's last day. "As far as Matt was concerned, it was a great day," he said. "He loved his family and they, in return, were devoted to seeing Matt achieve his dreams. "The other day I asked my eight-year-old son if he understood what happened to Matty. "He said Matty's somewhere where there are plenty of skateboards. "Then he looked at me and said, 'it's okay dad, we'll see him again'." Swimming coach Steve Short said Matt was a champion competitor, champion lifesaver, future champion and great mate. "He was all that and more. But today I want to speak about the other Matt. "The whacky kid who cut every bit of fat off his steak and chicken, and then would go and eat a whole meat lovers pizza." Mr Short spent three years as a coach at Maroochydore working with Matt. He said those who knew Matt knew 15 hours of coaching him meant another 15 looking after him. "He was definitely in the hard basket - but that's what was so special about Matt," Mr Short said. "He loved being one of the elite (competitors) and everything that went with it: the chlorine-bleached hair, the girls he thought had the hots for him, the results he got and the rep gear." Mr Short said one thing Matt wanted more than anything was to lose his "pigeon chest". "He told me, 'There's one thing holding me back from getting any girl he wanted'," Mr Short said. His coach's advice was that he wanted Matt "strong, not massive". "Surely that means bigger pecs," Matt asked with hope. Mr Short said Matt was a talented swimmer but he hated training. At 4.30 in the mornings he would go to extraordinary lengths to avoid or delay it. "He only did it to be one of the elite ironmen, one of the guys on TV," Mr Short said. He said Matt was the only person he knew who would turn up to the pool in boxer shorts, which was only so he could miss the first laps while putting his swimmers on in the change rooms. "Matt has left us for a better place, a place where he can sleep in for as long as he likes, where there is loads of chocolate and endless barreling waves. "And, of course, now he can have the biggest pecs that he wants to." Mr Short paid tribute to Matt's parents and sister for their strength. "You're not alone and you never will be," he said. 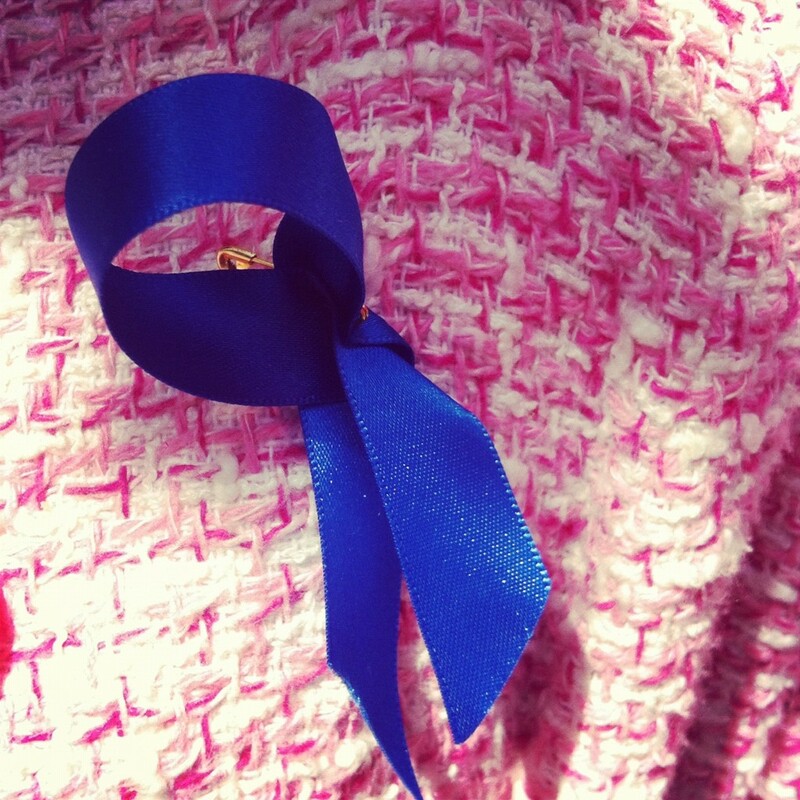 "There's a piece of Matt in everyone's lives. Rest in peace." 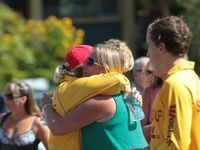 Maroochydore Surf Life Saving Club head coach Clint Robinson said Matt the competitor had a level of poise and comfort far above his years. He relived the fateful Thursday morning on Kurrawa beach when Matt's body was found. Mr Robinson said he could never imagine what the family had felt and did not know what to say to Steve and Donna. "It's a very difficult thing to walk over to a parent that has just lost their son and know what to say," Mr Robinson said. "As I walked over to Steve, I said 'how are you all' and he said 'I'm doing alright'." Mr Robinson offered any service the family needed. Mr Barclay said: "While this is a tragedy we have to be thankful that our son died doing what he loved." Mr Robinson paid tribute to the family's strength. "Yes he has gone and left us all too early, but my goodness he lived," Mr Robinson said. Matt, who loved to quote boxing great Muhammad Ali while pulling faces, was farewelled with quotes from the great man, including: "I have wrestled alligators and tussled with a whale". THIS long weekend, lifesavers will line our beaches to protect us from rising seas. Today, Maroochydore Surf Lifesaving Club president Tim Ryan is hoping many will return the favour by supporting Matt Barclay, his family and the lifesaving community in its hour of need. 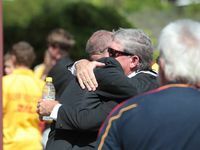 He has urged club members and lifesavers from across the Coast to come in their club colours and surf patrol uniforms to join the guard of honour at Matt's funeral. The celebration of Matt's life will be held at Our Lady of the Rosary Church on Edmund St, Moffat Beach, from 11am. Hundreds will fill the church for the service led by Coast priest Father John Dobson while seating has been provided for hundreds more outside to watch proceedings on large television screens. The funeral service will be followed by a wake at the Black Swan Room at the Maroochydore clubhouse. Young lifesavers and their families will also be catered for downstairs and on the beach with barbecues and volleyball from 1.30pm to 3.30pm. Mr Ryan said the celebration of Matt's life was not just for the lifesaving movement but for everyone who appreciated lifesavers. In the past week, the club has been inundated with offers of help from clubs across Australia. "I think every club in Australia has emailed us, rung us or texted us. It's pretty special, mate,'' Mr Ryan said.